The building complex from 1929 offers a total of 20 condominiums, divided into 16 existing apartments and 4 new apartments in the attics. Thanks to the rental pool, rental income is guaranteed for a period of 6 years. 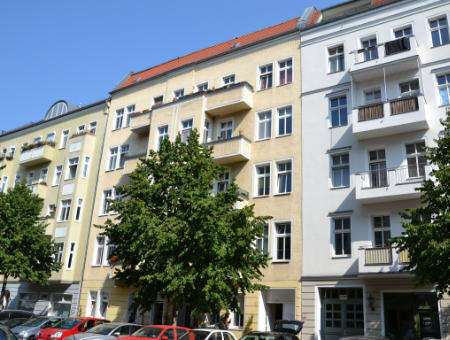 In addition, the immediate proximity and the view into either the green or the Havel make this residential district an attractive investment in Berlin. The ensemble was built in 1929 by the famous builder and mason Johann Makowka and remained until 2017 owned by his heirs. The apartments are almost all in east-west orientation, convince with clever floor plans and pleasant room heights. The cassette doors, window rungs and floors also have classic old belly arms. Now is the time for a makeover of this unique living ensemble come. The first construction phase with a total of 52 condominiums was almost completely sold within six months. Thus, the construction work could be started as planned and our entire renovation work carried out according to plan. According to the state of the art, the apartments are handed over before the contractually guaranteed completion date. The house Stubenrauchstraße 5 is a three-sided free-standing, neo-baroque, four-storey residential building, erected between 1899-1900 according to plans by F. and H. Wessel. For sale are a total of four residential units with sizes from 87m² to 238m². The house is a single-storey house with bourgeois homes. It consists of a front house and a long side wing, which is oriented towards the park-like green area. The three-axled front house shows loggia, central risers and windows as well as at the corner a broad oriel through all four floors. On a more than 10,750 square meters plot with mature trees we offer 72 condominiums with 2-4 rooms. The park and the terraces are not only in name, they are flagship of an entire object. The terraces offer more space than most balconies in Berlin. The triple glazing of large panoramic windows give noises from outside no chance. Light flows freely in the apartments with a ceiling height of about three meters. In addition to 65 outdoor parking, play areas for children and a communal barbecue area on the property are also arranged. The official launch of sales will start shortly.